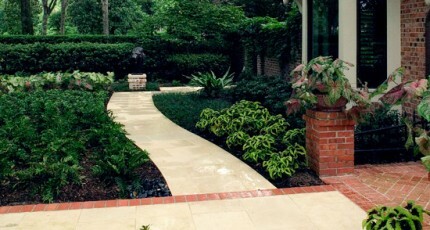 Adding a garden walkway to the landscape immediately adds curb appeal to the entire property. Paths and walkways are an integral part of formal garden design. Less formal types of gardens also rely upon pathways to bring guests into their interiors or to lead them alongside their borders. Without these carefully planned and constructed transit spaces, we would not be able to experience a garden from the perspective of its interior. Lawns would also suffer, because people would be forced to walk on the grass rather than a surface that is designated specifically for foot traffic. Equally significant to quality, professional landscaping, garden walkways are every bit as decorative as they are functional. The patterns they create throughout the landscape reflect the geometry of home architecture. As artisan craftsmanship, the enhance vegetation with definitively human and artistic touch that blends structure with the natural forms inherent to Nature’s design. While it is possible for the individual homeowner to build his or her own garden walkway, more often than not, the results are disappointing. This is seldom due to a lack of design skill on the part of the do-it-yourselfer. Instead, less than optimal outcomes result from residents not having access to the very best commercial stone and masonry products. Quarries, brick mills, and other manufacturing sources simply are not in the habit of selling their best products to individual homeowners. They sell commercial grade products to contractors, and they distribute second-rate materials through retail channels available to the general public. Bluestone– Bluestone is a very high-grade type of stone that stands out even when laid as a strictly horizontal surface over the ground. Sections can be removed and replaced with gravel to create planters for exotic plants or even small trees. Travertine Pavers– Travertine is a sedimentary rock that makes excellent patio and walkway surface areas. Concrete Pavers– concrete can be finished and stained to imitate bluestone or travertine at a lower price point, and often works even better than natural stone in many modern and contemporary gardens. Brick– Brick is an ideal compliment to traditional architecture and landscape design. The more quaint and rustic the home and garden, the more brick adds that extra sense of “home sweet home” to the scene. Granite- Granite is every expensive, but it is also very formal and lends itself to the sublime, the historical, and even the monumental. Many people who cherish their greenery sometimes fear that building a garden walkway will detract from the aesthetic of their plants. In reality, the opposite is the case. Trails are found all over the world in wild places. When we look at a garden as a cultivated segment of Nature’s diversity and symmetry, a walkway can be similarly perceived as a refined upgrade to a natural pathPerhaps the most powerful impact that a garden walkway has on a scene is its ability to alter the way one perceives the garden itself. Different elements have different optical effects. For example, steps create areas of interest by establishing differentiated levels of contrast. They also add vertical impact to the otherwise flat Houston landscape. Adding a winding trail to a square garden makes the garden look less overwhelming. Creating a narrow path in a small garden makes the garden appear larger than it is. If the garden is very large, and if it resides in a very large yard that overpowers the senses, bisecting the garden diagonally and integrating plantings into the hardscape will diminish the sense of being overwhelmed and establish a more acute sense of intimacy and warmth. For more the 20 years Exterior Worlds has specialized in servicing many of Houston’s fine neighborhoods.